Paolo Beria (1978). Assistant professor in Applied Economics at DiAP, Milan Politecnico University. Master degree in 2003 in Civil Engineering and PhD in “Urban projects and policies”. He is carrying research and professional activity at Politecnico di Milano. His fields of interest are economics, regulation and assessment of transport projects. Professor of “Infrastructure Planning” and “Project Evaluation” at Milan Politecnico and lecturer in “Transport Economics” at IULM University. Raffaele Grimaldi (1983). Research fellow at DiAP, Politecnico di Milano university (Italy). Master degree in 2008 in Transport Civil Engineering. He is carrying research and professional activity at Politecnico di Milano. His fields of interest are economics, regulation and evaluation of transport projects. Italy has undergone, in the last 15 years, an exceptional public financial effort to build approximately 1,000 km of high speed rail lines. Further extensions are under construction or planned, especially in the most important international relations. This network is widely considered as fundamental to comply the European vision of a continental-wide transport system.The paper analyses the past and the future of such network, where possible from a quantitative point of view. The first part of the article reviews the history of the Alta Velocità scheme, particularly focusing on the issues related to the economic regulation of the investments and the financial troubles at first and then on the present issues related to the regulation of rail services.The analysis of the supply, the time gains, the demand and the costs allows to build a simple but independent evaluation of the past projects from an ex-post perspective, pointing out the successes, but also important critical issues.The second part of the paper analyses the future expansion plans looking at the costs, the existing and expected demand and derives some policy indications and cost reduction strategies capable both to control public expenditure in a period of crisis and not to abandon the idea of a modern and effective rail network. BBT (2002),Simulazione d’esercizio. Rapporto 2002. [in Italian and German, “Operating simulation. Report 2002”] Brenner Basis Tunnel. Beria P., de Rus G., Quinet E., Schulz C. (2010), A comparison of rail liberalisation levels across four European countries, Selected Proceedings of the 12th WCTR Conference, Lisbon (PT). http://www.wctr2010.info/WCTR_Selected/default.htm. Cascetta E., Papola A., Pagliara F., Marzano V. (2010), “Analysis of mobility impacts of the high speed Rome–Naples rail link using withinday dynamic mode service choice models”, Journal of Transport Geography, 19, 635–643. Corte dei Conti (2009), Relazione sul risultato del controllo eseguito sulla gestione finanziaria di Rete Ferroviaria Italiana (R.F.I.) S.p.A. per l’esercizio 2007. Delibera 44-09. DfT (2011), Economic Case for HS2: The Y Network and London – West Midlands, Department for Transport, UK. de Rus G., Nash C. A. (2007), “In what circumstances is investment in HSR worthwhile?”, ITS Working Paper 590, February 2007, Institute for Transport Studies, University of Leeds (UK). de Rus G., Nombela G. (2007), “Is Investment in High Speed Rail Socially Profitable?”, Journal of Transport Economics and Policy, 41 (1), 3-23. ENAC (2007), Dati di traffico 2010, [in Italian], Direzione Sviluppo Aeroporti, Ente Nazionale Aviazione Civile. ENAC (2010), Dati di traffico 2007, [in Italian], Direzione Sviluppo Aeroporti, Ente Nazionale Aviazione Civile. FS (2007), Piano industriale 2007-2011, Roma. FS (2009), “Alta Velocità: crescono i viaggiatori, prosegue lo sconto sui biglietti”, FSNews, 29th january 2009, website: www.fsnews.it, Ferrovie dello Stato SpA, Roma (Italy). FS (2010), “Alta Velocità 2010: in crescita viaggiatori e gradimento del servizio”, FSNews, 10th december 2010, website: www.fsnews.it, Ferrovie dello Stato SpA, Roma (Italy). Gronda di Genova (2009). Dibattito pubblico. 1° incontro tematico. La Gronda e gli scenari di traffico e della mobilità. Minutes of the Public Debate, Genova, March 7th 2009. ItaliaOggi (2010), “FS, il boom dell’alta velocità”, p. 14, 27th October 2010. MIT (2010), Programma infrastrutture strategiche, [in Italian, “Strategic Infrastructures Program”], Ministero delle Infrastrutture e dei Trasporti. 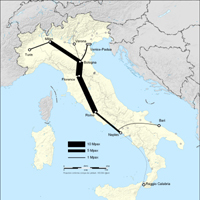 MTN (2001), Piano Generale dei Trasporti e della Logistica, [in Italian, “General Plan of Transport and Logistics”], Ministero dei Trasporti e della Navigazione. Nash C. A. (2009), When to Invest in High-Speed Rail Links and Networks?, Discussion Paper No. 2009-16 December 2009, Joint Transport Research Centre, International Transport Forum, OECD. Osservatorio Torino-Lione (2007), Scenari di traffico. Arco alpino, [in Italian and French, “Traffic sceneries. Alps”], Quaderno 02. Osservatorio collegamento ferroviario Torino-Lione [Observatory Turin-Lyon rail link], Presidenza del Consiglio dei Ministri. ResPublica (2010), Strumenti innovativi per il finanziamento delle infrastrutture di trasporto, ResPublica, Milano. RFI (2005), Metodologia per la valutazione economica degli investimenti: l’analisi costi-benefici. [in Italian], Rete Ferroviaria Italiana, Ferrovie dello Stato. RFI (2007), Rete AV/AC. Analisi dei costi, [in Italian], presentation, Rete Ferroviaria Italiana, Ferrovie dello Stato. RFI (2009), Itinerario Napoli-Bari. Analisi economico-sociale degli investimenti programmati. Progetto Preliminare delle fasi prioritarie. Rete Ferroviaria Italiana. Direzione strategia e pianificazione. Ferrovie dello Stato. RFI (2010), Nuova linea AV/AC Venezia – Trieste. Tratta Ronchi-Trieste. Progetto Preliminare. Studio di impatto ambientale, sintesi non tecnica. Rete Ferroviaria Italiana. Direzione tecnica – U.O. Ambiente e archeologia. Ferrovie dello Stato.